while also giving back to the community. Up-N-Running has a wide range of accessories. Stop by the shop for our selection of gels or chews, hydration equipment, reflective gear, massage tools, sports lubricants, and much more! Many of you knew Lazlo. He was a loveable Black Lab that spent time out at the North Pittsburgh store. Sadly, we've had to say goodbye to our best friend. Lazlo was more than a pet dog. He was mascot to our store, friend and companion to all he encountered, and family to the Doyle's. We are deeply saddened by this loss, but thankful that we have so many wonderful memories with our furry friend. Many had asked if we would ever come out with shirts with his picture. 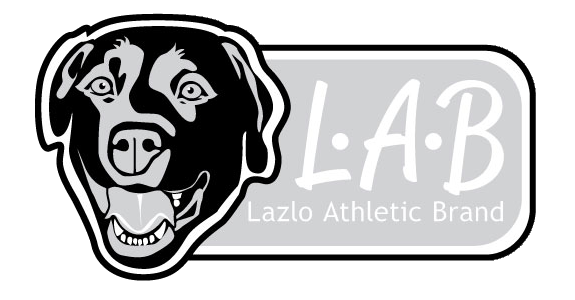 So in response to Lazlo’s fans, we have our LAB line of running shirts. They are technical shirts with a reflective Lazlo as the logo and one of several run-oriented sayings. Stop in and check them out! Looking for a gift for the runner, walker, or fitness fanatic in your life and unsure what to get? An Up-N-Running gift card is always a great fit. Stop by the store to pick one up. Unable to make it to the store? While we don't yet sell gift cards online, if you call us we can mail them anywhere! Up-N-Running is in the business of supplying you with the products and guidance you need to keep you active. We have a full line of running, walking, and racing shoes from Brooks, Asics, New Balance, Saucony, and Mizuno. We also carry technical workout gear for all seasons and conditions, as well as all the socks, energy gels, hydration products, accessories, and gadgets that you didn't even know existed. It doesn't matter if you are headed out for a run outdoors in any season, sticking to the treadmill at the gym, or taking a Zumba or PiYo class, we have what you need to exercise in comfort. Up-N-Running is a full service running shop, which means our expert staff will perform gait analysis and study wear patterns on your old shoes to determine your foot biomechanics. Once we identify what type of shoe is best for your foot, you'll be presented with several options to try on that fit the category. This process is the same for the seasoned marathoner, high school track/XC athlete, casual runner, or anyone who is active on their feet. Every Thursday through the summer, join us for the Shoes & Brews Run starting at 6:30PM. For Saturday morning and other group runs, please look for posts on Facebook about meeting times and locations. Look on Facebook, call the store, or email shoes@runpa.com for more details. 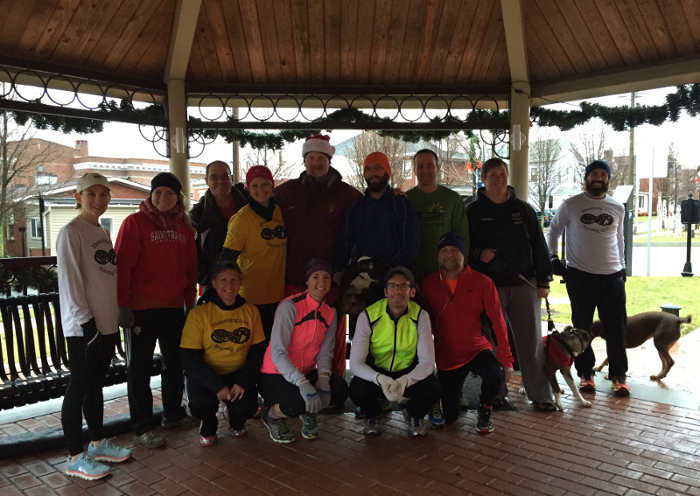 Join us for weeknight and weekend group runs. On Wednesday evenings, meet us at 6:15PM at the Central Cambria HS Track. The 3rd Thursday of each month will be a Shoes and Brews Run. After the run, we will try great seasonal and/or local craft beer. Check our Facebook page for more details about group runs. Look on Facebook, call the store, or email julie@runpa.com for more details. We've got your race calendar covered with our Local Races North Pittsburgh Guide. Run over to our race page to see what races are coming up within 100 miles of the North Pittsburgh Shop! We've got your race calendar covered with our Local Races Ebensburg Guide! Run over to our race page to see what races are coming up within 100 miles of the Ebensburg Shop! It all started on Fourth Street in Verona. Growing up in the 50’s and 60’s in suburban Pittsburgh we had a fantastic childhood! Unlike today’s youth, there were no smart phones, home computers, video games, or reality television to keep us busy. It was all about being outside, playing baseball, football, hide-n-seek, and army in the woods. Being post World War II baby boomers, there were plenty of us kids out on Fourth Street. Little League and organized sports in general, were in their infant stages. Your's truly was not very coordinated in anything besides running, so that was all we seemed to do. We were quite fortunate to have a very sports-influential family the Flynns, on Fourth Street. Each of the ten Flynn kids was an athlete in some form, and Mr. Flynn was their biggest fan. He took me under his wing and got me started running track and cross country for Penn Hills. My career started out paralleling the famous Steve Prefontaine: we were both baby boomers, we were both uncoordinated in any other sports, and we were both runners. That’s about where the similarities stop. Steve Prefontaine ended up holding most American long distance records before his tragic death, whereas I ended up running as the 7th or 8th runner on the Penn Hills Cross Country team, with my only accolade being a Cross Country letter. But that started a passion that has helped guide me and my family through life. Fast forward to the 1990’s and this father of four all of a sudden being the biggest fan of my own kids. All four did organized sports, three of which ran track for Knoch high school. Those accolades that I so desperately tried to achieve as a child were at some level achieved by my kids. Kevin, the oldest boy, found that he was a pretty good runner and went on to break many of the Knoch distance records. He subsequently received a scholarship to run track and cross country for St. Francis University and later followed his friend Brian Sell to run in Michigan for the Brooks Hanson’s Distance Project. Fueled by an almost fanatical passion for American distance running, the Hanson brothers created an elite program funded partially by their series of specialty running stores in the Detroit area. Their program ultimately helped to send Brian Sell to the 2008 Beijing Olympics in the marathon. They ended up being another in a series of influences to me, now a quite slow distance runner. Both Kevin and Keith Hanson helped me to put together the mechanics of what is now Up-N-Running. We opened our doors in Butler County in 2004 with the extended family all playing a major role in the successes of Up-N-Running. 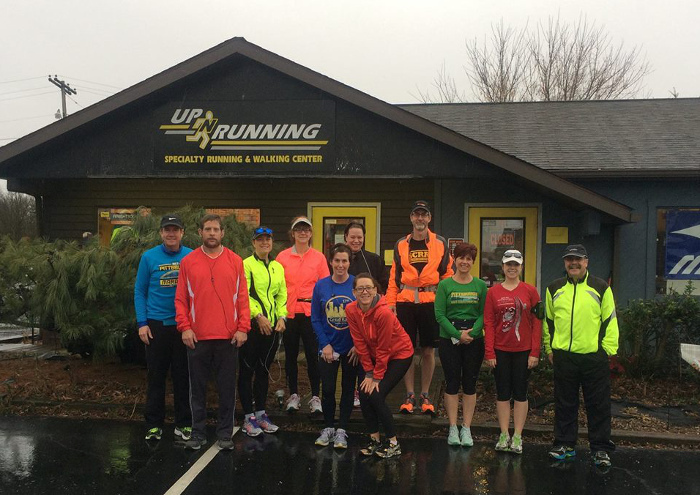 Our mission was simple: help to create a running-friendly environment in Western Pennsylvania, and give back to the community, while also providing a livelihood. Everyone took part in the business. Mom became our accountant. Kevin is our technical advisor. His wife Julie puts together the website and updates. Bonnie is in charge of bolstering our online presence through social media from, of all places, California. Lindsey is our marketing coordinator. Pat handles the screen printing portion of the business (Lazlo Athletic Brands). My wife, Carol is the ultimate inspiration, keeping yours truly firmly on the ground. And we mustn’t forget Lazlo! Laz is the official store greeter. He’ll wag his tail and bring you a present as you walk in the store. It is truly a family project and an on-going passion for all of us! 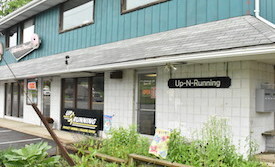 Welcome to Up-N-Running! We all look forward to helping you achieve your goals!! Ed ran cross country and track for Penn Hills high school in the 70's. Upon graduation he gave up competitive running but continued jogging to stay in shape. Ed completed his first marathon at age 50 at the 2003 Pittsburgh Marathon. He has since completed several additional marathons. In his spare time, Ed enjoys fly fishing, wood carving, and hiking. Ed currently trains in the Saucony ProGrid Hurricane. Adriana was born and raised in Mexico City. After doing some traveling and living abroad in Latin America, Europe, and some of Northern Africa, she graduated from college with a degree in Hotel Management from a university in Mexico. She relocated to Pittsburgh in the summer of 2000. She now calls Pittsburgh home, having become an avid Penguins fan. Adriana ran her first race in 2009 at the age of 35 - a 5k without any training at all. She ran in 35:32 and was told that with a little training she could become a good runner. She kept at it, running a few races with no running prior to race day. It wasn’t until 2017 that she seriously considered running and training. She started with a couch to 5K program. 10 months later ran her first half marathon and for once didn’t feel like dying at the end! She is an avid trail runner. She continues to increase her distances with a full marathon in her near future. She also has goals of a sub 2 half marathon plus completing trail races of various distances. Aside from running and work, Adriana has 2 teenage children that keep her busy as they participate in Irish dance, hockey and baseball. 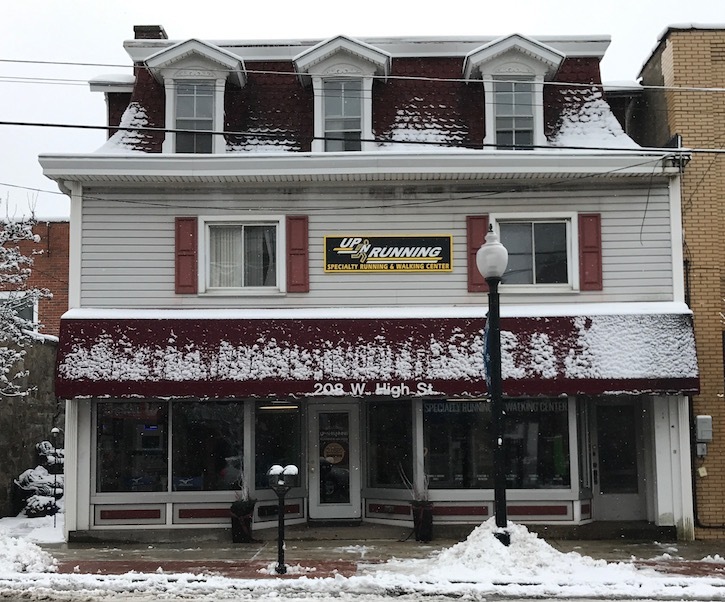 Inspired by the success of Up-N-Running North Pittsburgh and encouraged by the warm reception of the vibrant Ebensburg running community, Up-N-Running Ebensburg is owned and operated by Julie and Kevin Doyle. Both originally from Butler County, we have called Ebensburg home for nearly a decade. While neither of us envisioned settling down in Cambria County, we can't imagine any other community to be a part of or anywhere else to raise our 3 children. 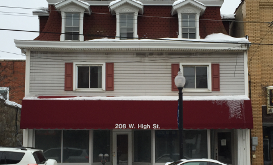 The Ebensburg Area Running Club (EARC) has also served as a huge inspiration for us in our decision to open this store. The success of the annual Turkey Trot 5k and the summer couch to 5k program has bolstered our enthusiasm about running and made us believe that this is truly a running town. Julie, a chemical engineer by trade, is the shop's full-time manager and chief running officer. She brings with her years of running experience, an analytical / data-driven mindset, and a discriminating eye for aesthetics to the business. A veteran of many half-marathons, Julie made her marathon debut in 2012 clocking a time of 4:03:35 at the Richmond Marathon. Kevin is a full-time software development team manager by day and part-time shoe guru on nights and weekends. He comes from a competitive running background. His running accolades include school records in high school and college - St. Francis (2002), a brief career as a professional runner, and the privilege of representing Team USA at the 2003 Chiba Ekiden Relay in Chiba, Japan. Kevin also brings vast running shoe experience with him to the business. He worked at the famous Hansons' Running Shops in the greater Detroit area from 2002-2004, managed Up-N-Running North Pittsburgh location during its first year of operation, worked as part-time technical guru for Brooks, and has conducted numerous technical presentations on running and running shoes for various groups in Central and Western PA. 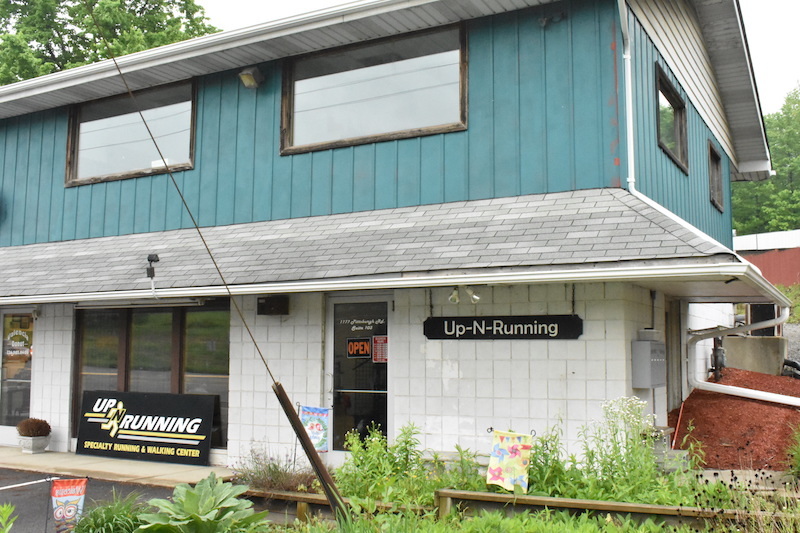 Welcome to Up-N-Running Ebensburg! We all look forward to helping you achieve your goals!! Julie ran Cross Country and track for Knoch High School as a way to get in shape for basketball. Little did she know that running would become a life long love! Julie has completed many races of distances from 2 miles through 26.2 miles. Notable times include 21:47 for 5k, 1:14:16 for 15k, 1:41:19 for the half marathon, and 3:55:12 for the marathon. In her spare time, Julie enjoys running around after her kids, trying new beers with her husband, creating things, and reading books for wine, er, book club. Julie currently trains in the Saucony Ride and Brooks Glycerin. Kevin started running in high school to stay in shape for soccer and thrived from the start, still holding school records in the 1600m (4:19) and 3200m (9:36) for Knoch High School. He continued competing for St. Francis from 1998-2002 and was a multi-time NEC champion in track and cross country, NCAA XC National Championship qualifier, and still holds the school record for 5000m run (13:55). Kevin went on to train and compete professionally for the Hansons-Brooks Distance Project in Michigan where he raced all distances from 1 mile to 10 miles. Training in excess of 100 miles per week and running cross country, road, and track races, he posted some fast times at 4 miles (18:36), 8k (23:10), 10k (29:03), and 10 miles (49:20). His crowning achievement was qualifying for team USA for the 2003 Chiba Ekiden Relay in Chiba, Japan, running a 10k relay leg against some of the best runners in the world. Kevin retired from the competitive running world in 2004 in order to pursue a career and family, but has continued running as a lifestyle. His most recent running achievement was finishing in the top 100 at the 2014 Boston Marathon in a time of 2:30:04. Outside of running Kevin enjoys trying new beers with Julie, fly fishing, and playing with the his 3 wonderful children. Current training shoe is the Mizuno Wave Rider and current racing shoe is the Brooks Launch. Join our mailing list or follow us on social media for the latest updates.